Have we all gone completely mad? That is the question to which I keep returning as I contemplate the future of my beloved home county of Northumberland. On many days the pictorial “View of the North” that graces this paper’s letters page features a glorious, panoramic view of the unspoilt Northumbrian countryside. The one from Auchope Cairn yesterday was a particular gem. Surely anyone can see that these landscapes, and the precious tranquillity they offer, are our greatest economic asset? They are the reason people move here and spend their leisure time here, and so support a wide range of local enterprises. Why are we even contemplating the utter folly of trashing all this beauty and peacefulness with growing numbers of gigantic wind turbines? Yes, I know a few people find them beautiful: one person e-mails me every time I write on this subject to tell me so. I also appreciate that others sincerely, though misguidedly, believe that we have no alternative but to make this supreme sacrifice in order to “save the planet” from the effects of manmade climate change. Such zealots may be relatively few in number, but they seem to have had, up to now, a wholly disproportionate influence on those framing national energy and local planning policies. 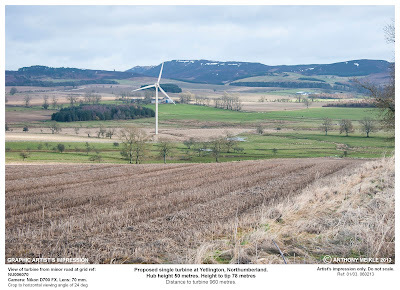 Hence we have crazily allowed an array of giant 410ft turbines at Wandylaw and Middlemoor to wreck the once glorious views from the “Heritage Coast” to the National Park. Yet any idea that “enough is enough” seems utterly alien to the subsidy-hungry promoters of these monstrosities, who are now eager to pile on yet more damage to the adjacent fine scenery at Middleton Burn and Belford Burn. This is the view that St Cuthbert would have enjoyed from Lindisfarne, and one wonders when and how he is likely to react. After all, he has form in these matters, having famously shrouded Durham cathedral in fog to save it from approaching German Baedeker raiders in 1942. Perhaps he will send down 25 years of impenetrable coastal haar. 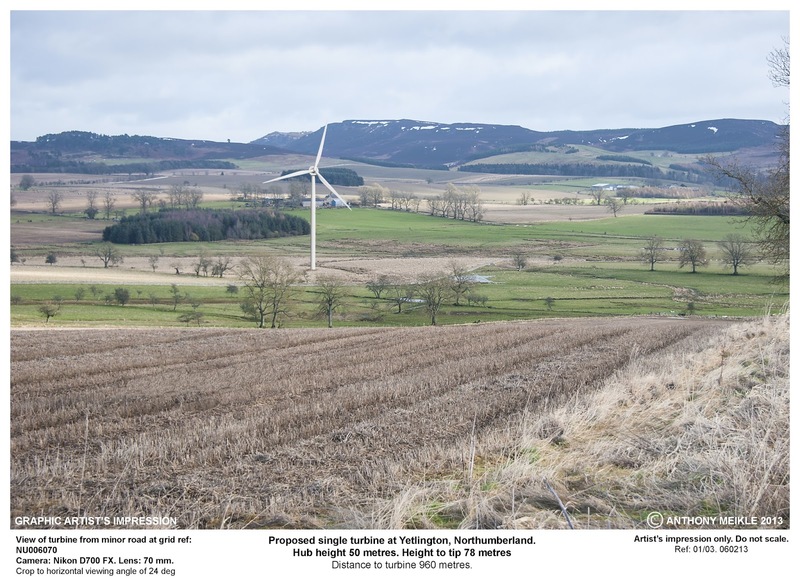 Meanwhile, as I wrote last week, another applicant is seeking to insert the thin end of the wind farm wedge into Whittingham Vale and Coquetdale, with an application for a 256ft turbine at Follions Farm. This may be smaller than the behemoths of Wandylaw but it will still dominate local views, plonked in the middle of open countryside designated as of high landscape value and right on the fringe of the National Park. There could be few worse places to erect a turbine unless we intend the National Park to be completely hemmed in by wind farms on every side. Bafflingly, in view of the overwhelming weight of objections from local residents, visitors, parish councils and the National Park itself, this proposal has been recommended for approval and comes before the Planning Committee at County Hall at 6pm this very evening. Distributing leaflets to bring this to the attention of my neighbours on Sunday, I found considerable anger that their views are apparently being ignored by those in authority; but also, in some, a fatalistic sense that “there is nothing we can do”. Well, there is. The ruination of our county by onshore turbines is no more inevitable than the widely predicted triumphs of fascism or communism, or UK entry to the euro. We just need, collectively, to make it emphatically clear to our elected representatives how we feel on this issue, and that they won’t be in office too much longer if they choose to ignore us. Do please join me and my neighbours at County Hall this evening if you can. 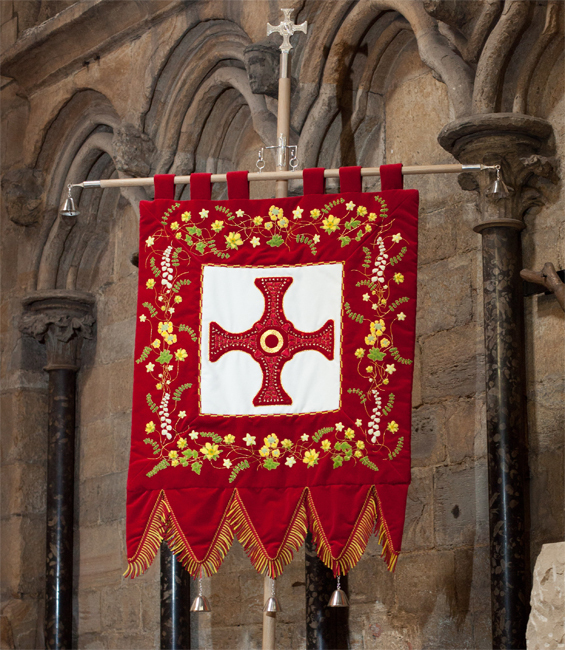 We shall come in peace, though I may see whether we can borrow the newly recreated banner of St Cuthbert to accompany us. Even if not, I feel sure that he will be with us in spirit. We peasants may be growing madder, but surely sanity will ultimately prevail. Won’t it? This blog post seems to have mysteriously disappeared for a few days, which has never happened before. 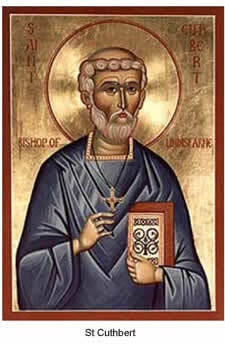 I do hope that I haven't offended St Cuthbert. But sanity did prevail on the important issue: see http://www.northumberlandgazette.co.uk/news/local-news/a-turbine-here-would-be-a-crime-1-5932198 Though not necessarily on the less vital one of where a man should let his left hand rest when being photographed.